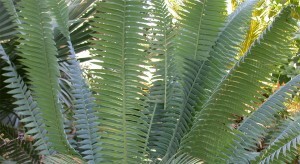 Cycads are often referred to as “living fossils,” given the fact they were around when dinosaurs ruled the earth. The plants’ female cones bear fleshy-coated seeds, which are thought to have been eaten and then distributed by plant-eating dinosaurs. Of the 300-plus species still living, many are treasured for their slow growth rate, low maintenance and aristocratic appearance. Maurice Levin, proprietor of Jurassic Garden Nursery in Chatsworth, will reveal the secrets of gardening with these “living fossils” on Saturday, Nov. 4, from 9 to 11 a.m. at California State University, Northridge as part of the university’s CSUN-al Gardening series. His talk will include the care and maintenance of cycads, including the challenges of propagating and growing these endangered species successfully in Southern California. Visit the Botanic Garden website, www.csun.edu/botanicgarden/, for more information.